Note: Yesterday, my TV segment aired on The Doctors; see my post last week about the behind-the-scenes experience! You can watch it here on The Doctors youtube channel. In the April Issue of Prevention magazine (on newsstands now), with Vanessa Williams on the cover, there is a nice big story on me, with great photos of my food and my kitchen! There is even a picture of my dog, Pippa. They asked me to cook an Easter dinner, since Easter is coming up on April 4. 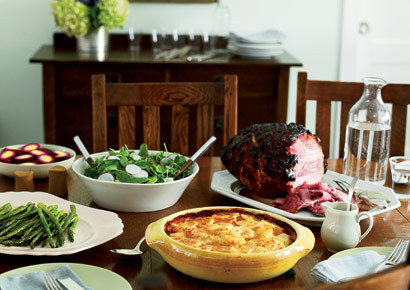 So, of course I had to make my famous ham (with the actual ham coming from Heritage Foods), scalloped potatoes, asparagus, and salad with peas and mint—all seasonal delights! 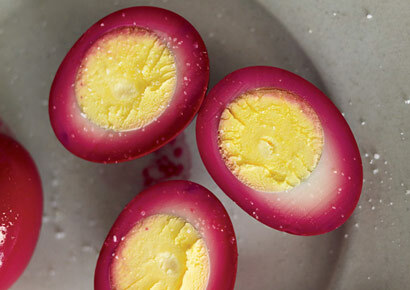 I even made my pickled red beet eggs, which you can see in an amazing photo below or in a nice slide show on Prevention.com. When you do a shoot this elaborate, they bring along food stylists and cooks, and all sorts of people hang out in the kitchen all day. After I made the scalloped potatoes with a dozen people staring at me, one woman said, “Wow! That really is simple.” That’s when I came up with the phrase “extreme simplicity” for my cooking. I am interested in paring a recipe down to its purest essence, and removing any needless complications (or extra dishes, for that matter). Extreme simplicity only works, however, when you are starting with really good, fresh (and organic, of course) ingredients. I remember reading once that the reason spices were so valuable in the olden days was that they covered up the taste of old, stale food. Although I do love spices too! Speaking of great ingredients, the rhubarb you see in the shot was grown organically in a greenhouse (the shoot was done in January). I for one had never seen rhubarb so red before, and it sure tasted great. When I make my usual rhubarb it’s never quite that red, so don’t feel bad if yours isn’t either. P.S. Let me know what you think of the apron I’m wearing! I have been designing them using organic fabric, working with my Mennonite friend Ida Burkholder, who sews them for me. We’ve almost got it just right, so I’d love to know if any of you would ever wear an apron like this. This Easter dinner is easier to make than it looks! The eggs look great, and taste great. 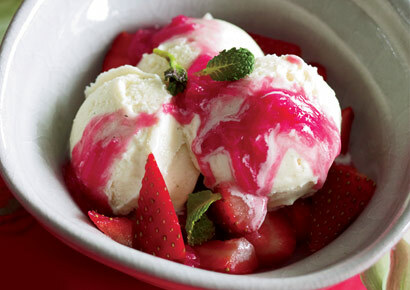 For dessert, ice cream with strawberries and rhubarb sauce. How do you like my apron? 17 Responses to See Inside My Kitchen! I love the apron, it has a very vintage look to it! 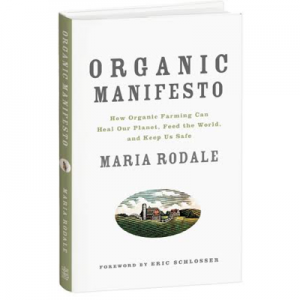 Are the aprons made from organic cotton? First time to read your blog, and I like it! About your apron…I love it!! …organic or not, its a good design, and flattering , too! The trim is what makes it professional , but also reminds me of vintage. I’m glad to see the long-enough-to wrap-around-you ties, and I would add only a kitchen towel over that tie for wiping my fingers, like the “pros” do ! Thanks, I’d like the pattern, any chances of that ??? Happy Spring ! Fran, CT. It brings me back to years gone by, happy times when my Mom was alive and doing her thing in the kitchen. It also brings me back to my own younger days as a wife and mom. Somehow there is comfort in the design. Koudos to you and your designer. I love the idea that the shoulder areas have coverage for splatter! when will they be available?? I love the apron. I would diffently wear that apron. It seems like I am always cooking and not using an apron that has the full coverage and then naturally i get butter or oil on my top that can be difficult to remove. The crisp white and trimmed in red, my favorite color red, looks very sharp. Very attractive, however I agree with Jean about color/print because I’ve got a couple of white “professional” aprons that look like they were worn by someone just learning to use utensils. Tomato, chocolate, oil, tea, you name it the stain is there and doesn’t wash out. I do like a full chest coverage apron with wrap around ties and big pockets. Love the apron, too. It would also work when I paint with the kids in my preK class–or make bread with them! I too, would prefer a print (vintage–to go with the style). I love how the apron is not so square around the chest and that you don’t have to have it hang over the neck. And it’s cute! Nice segment on The Doctors. Way to get the points across! Re: Ham….I would have loved seeing you use a LOCAL, free-range and heritage breed ham from a farm using organic methods. They’re also much less expensive than those from Heritage Foods. Re: Apron….Oh, yes, I would buy at least two! I tried to get my mom to go into apron production with me, but she has yet to bite. I would buy that apron. It is very flattering. I love the term “extreme simplicity” regarding cooking. I think that is how you could describe my cooking style for the last 20 yrs! I always thought of myself as a lazy cook, but your phrase sounds much better! Love the photos! I like the apron too. I think it would great with a patterned or darker fabric to hide pesky kitchen stains. 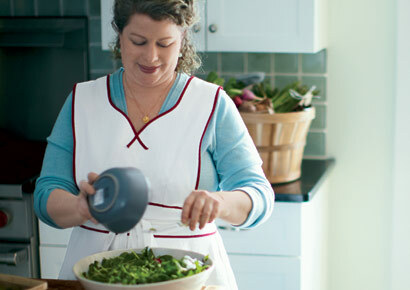 Your Easter dinner looks wonderful and the Apron is cute. The white does look nice and crisp and accented by the red trim. However, as mentioned previously I would need some kind of print as I am always spilling something on me in the kitchen. Just a little for the camera, Donna! No mascara though, that’s where I draw the line. Oh! I think you are a wonderful cook. 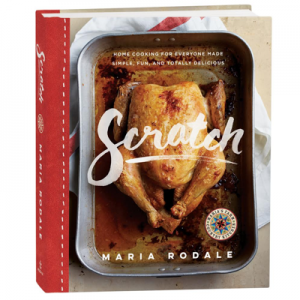 Thank you for sharing all your delicious recipes and great ideas. Love ya! in the apron that you are wearing. Happy Easter to you and your (happy) family! I love the apron. I would also prefer prints. I’m a rather messy cook. But the food tastes good! I also hate having aprons drag on my neck. This is a lovely style!